Commodities like gold, silver, and diamonds hold value across a variety of cultures and nations. Engagements, anniversaries, religious rites, and more, often come with the gift of diamond jewelry that is kept for years on end. Whether a diamond holds sentimental value or just purchased from a jeweler, some people turn to selling diamonds because of the high value that they hold. This leads to many people asking, "How are diamonds valued?" The answer to this is not a simple one: there are a large number of determining factors that will contribute to the value of a diamond. Even different types of jewelry going in and out of style can negatively or positively influence the value. The Gemological Institute of America has campuses all over the world that teach people the correct way to value a diamond, which further shows how difficult it can be. Despite this, you will be able to get an idea of the value of your diamond from where it falls on the scales for The 4 C's of Diamonds (Cut, Color, Carat, and Clarity). Cut - The cut is often mistaken for the shape of the diamond, but it is actually rated on the diamond's brilliance, fire and scintillation. Color - Graded on a chart from Z (Yellow) - D (Colorless), with the least color being most valuable. Carat - The carat refers to the weight of the diamond and is graded on a 100 point scale. Clarity - There are 11 different grade for clarity depending on the amount of blemishes. The cut is one of the most important things to consider when valuing a diamond, because the cut is what makes a diamond shine. 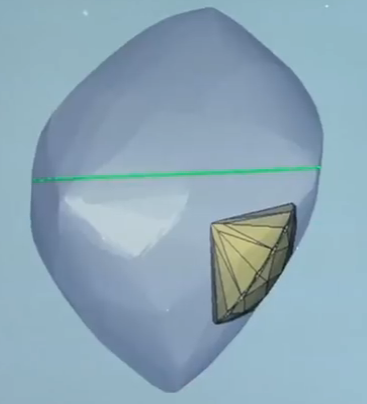 When light enters a diamond, it is refracted off the diamond's walls (cuts), and if the light does not exact through the top it will not shine as well. Diamonds can be cut too deep to too shallow and it will ultimately affect the value of the diamond. This happens when a raw diamond is either cut wrong, or the cutter chose the wrong shape for the diamond. Diamond cutters sort raw diamonds into two piles. Makeable stones are ones that can be made into one large stone, while others that have to be cut into two or fewer stones to maximize the diamond value. The picture below shows a computer determining the options the diamond cutter has when cutting the raw stone. As it states above, the cut is what gives a diamond its shine. In the diamond industry, they refer to three characteristics to grade the cut, and it is these things ultimately make the diamond shine. These characteristic that allow a diamond to transmit light are brilliance, fire, and scintillation. The three characteristics mentioned in the previous paragraph are all taken into consideration when grading a diamond's cut. The grade will fall into one of five categories with "excellent" being the best grade that you can receive. Excellent – These diamonds will have the most brilliance and fire while reflecting almost all light that enters the diamond. Very Good – Reflects a majority of the light that enters the diamond, producing superior fire and brilliance. 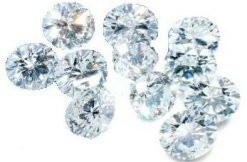 Diamonds rate “Very Good” will appear similar to “Excellent” diamonds under normal light conditions. Good – Reflects a majority of the light that enters the diamond, creating an above average appearance. 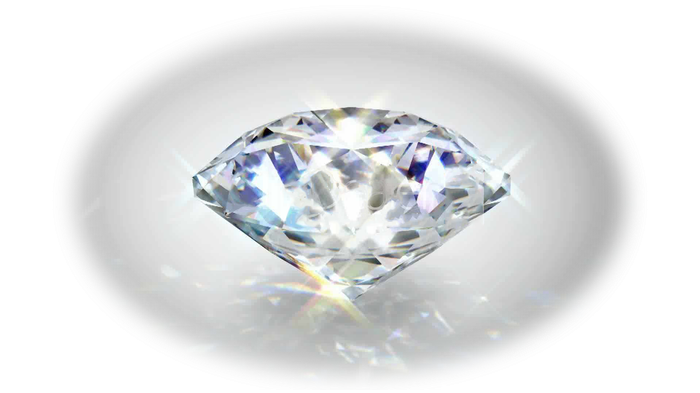 Fair – Reduced perceived fire and brilliance from allowing light entering the diamond to escape from the sides or bottom. Poor – Diamond will appear dull and lifeless from allowing a majority of the light to escape from the sides or bottom. 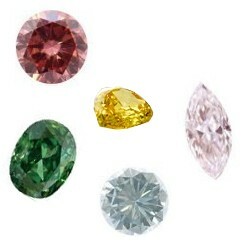 Most people imagining a diamond will likely think of a clear shiny stone, but in reality diamonds can come in a variety of colors. As you might expect, the less color in the diamond, the higher its value will be. To the untrained eye, diamonds may look all very similar in color, yet greatly differ on the color scale because of a slight tint. Some people are unfamiliar with the colors that diamonds can come in. Often times, these colored diamonds are used in large pieces jewelry. Colorless diamonds are the most common and often referred to as white diamonds. White diamonds are graded on a D - Z scale. A grade of D will be colorless diamond, while a Z grade will mean a good amount of yellow tint. While colored diamonds are not nearly as popular, they can contain a great deal of value. These types of diamonds are often used by jewelers to create different pieces. Earrings, bracelets, and more items containing colored diamonds allow people an alternative option. As style trends change, so can the value of a colored diamond. Many people who are shopping for a diamond are often drawn to the allure of a big diamond, while sacrificing other qualities. While the bigger the diamond, the higher the price generally holds true, the diamond still needs to rate well in the other categories to hold a good amount of value. A big diamond will not shine if it is cut poorly, so it is important to not focus solely on the size of a diamond. A carat is actually a unit of weight that is equivalent to .2 grams. The scale is broken up into 100 "points" with a 100 carat diamond being flawless 20g stone. With larger stones being extremely rare, the price will rise exponentially as the carat weight of the diamond increases. To the naked eye a many diamonds will seem perfectly clear without any blemishes. 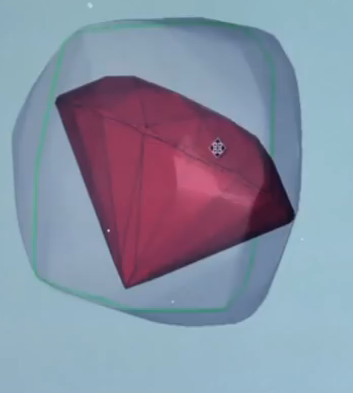 Despite not being able to see these problems, they can not only affect the value of a diamond but also its aesthetics. You may have heard of a diamond being cloudy, and these internal disfigurations are referred to as inclusions, while any outside of the diamond are considered blemishes. The GIA has eleven different categories in which a diamond's clarity will be graded as. A professional appraiser will look at the stone under various magnification levels, to determine the amount of blemishes and inclusions. 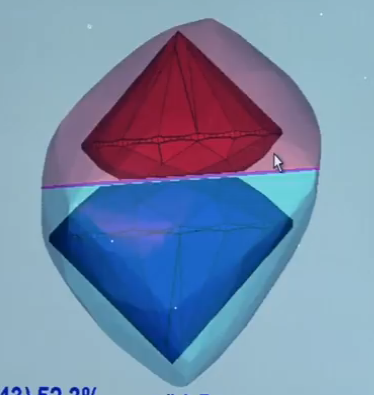 As you now know, there are a large amount of ways that a diamond's value can be affected both negatively and positively. This makes it difficult for the untrained person to determine a value for their diamond, along with the intricacies of the grading process. Having documentation about the diamond is one way for a person to find how it is graded. The GIA also has plenty of informative information on gia.edu. The 4 C's of Diamonds is the best place to start, but ultimately a professional will be the only one to assess the value of a diamond.